My name is Jenn and I am a cocktail enthusiast who is also a storyteller. This is the story of my adventures with all things cocktail—the drinks I drink, the bars I frequent (and who I am hanging out with), the bartenders who create the cocktails, the history of a cocktail or the origin of an ingredient. This fascination has been developing slowly over the last couple years. It began at the Modern in New York City with a French 75 made with St. Germain and has progressed slowly as I became more and more adventurous and discerning about what I ordered to drink. 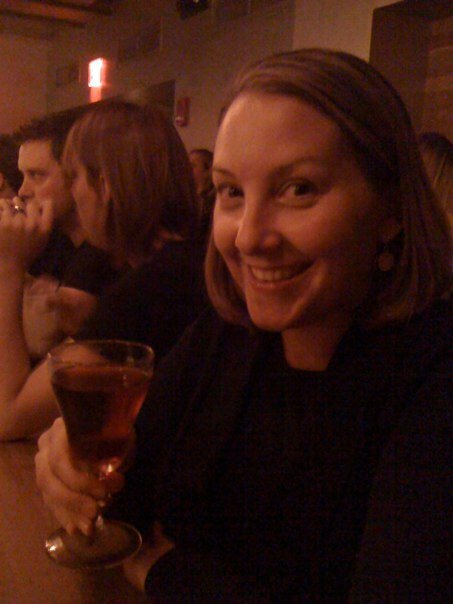 Then I discovered Drink, an amazing bar in Boston and got turned onto things like Chartreuse, Benedictine and Cynar. My world was opened up to liquid deliciousness by the bartenders who are masters at their craft. It is the beautiful colors, the complex flavors, the stories behind the ingredients and the history of a cocktail’s origins that I love and will share with you. By day, I work in an amazingly beautiful art museum in Boston that was brought to life by an eccentric woman who was, in many ways, ahead of her time. I find inspiration in the beauty of her creativity and in the works of art that fill the galleries. I find great pleasure in cooking for and entertaining friends and family. It is in the food and drink we prepare with care and attention that shows those we love a bit of our heart and soul. And I don’t just have other people make me drinks. I have been building up my own home bar and have been mixing up some pretty yum stuff. I also love to travel—and dream of living in Italy some day. I have lived in Washington DC, Worcester (MA), Montpelier (VT), and Santa Monica (CA), but somehow always end up back in Boston where I grew up. Despite the winters, I love New England. The changes of seasons add depth to the year, and keep me on my toes. I guess it’s not so much about the place per se, but the people. So, that’s enough of my story for now. Salute! The new header image on the blog features photographs taken by my friend and fabulous photographer, Ashleigh Stanczak. And those are my glasses, books, and bottles. I came upon your blog as I was searching for the name of the Monte Cassino cocktail…I love that drink, and heard it about it from the NYT article. I can always remember the ingredients, but not the name for some reason! So thank you for blogging about it, and linking to the original article! I think what you’re doing is awesome, and I wish you the best with your cocktail adventures! Kevin, I am glad to hear that the “tough” research I do is benefitting fellow imbibers. Cheers! Thank you for introducing me to the cocktail called Last Word. Yours was the link that pushed me over the edge so that I actually mixed a cocktail at home, properly. I’ve been experimenting while at restaurants that have bars, ordering various things over the years, but Last Word is my first solo effort. I’ve also never had it anywhere before. (Wow — so very good!) But I already knew that I love green Chartreuse. I like the taste of good gin (although my body has felt a little prickly on the rare occasion when I’ve tried it straight, which tells me that I might be allergic to juniper). I love fresh lime. And I recently bought Luxardo Maraschino liqueur on a whim and am enjoying its nutty-sweet effect. The combination for this cocktail is, in a way, unlike any of the ingredients alone, however. In my opinion, this is truly an instance of the whole being greater than the sum of the parts. And I suppose this is what true mixology is supposed to be. In any case, thank you! I feel complete now. Brek, I never thought a blog post would be the instance in which I engendered a “you complete me” response. But nonetheless, I am happy to turn you onto the Last Word– it really is perfection in a glass. oh – the Last Word – what a fantastic drink! That’s currently my favorite cocktail – it’s so good! thanks a lot, and cheers!